Avoid gross encounters in the sticky campground bath facility! 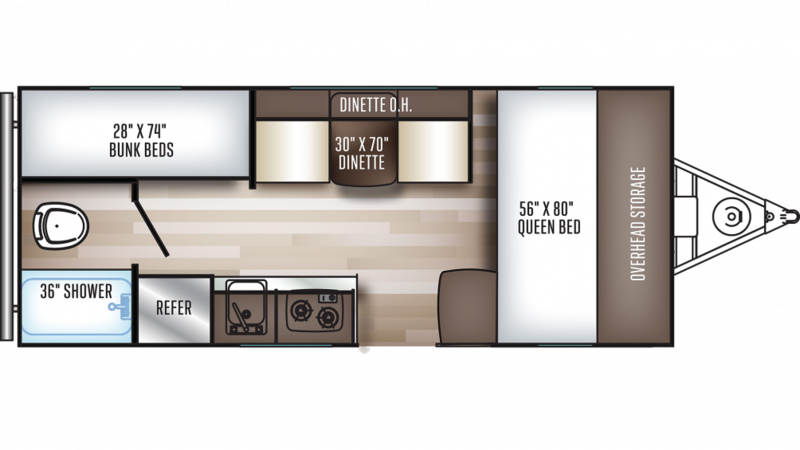 This RV comes with its own bathroom, and you'll appreciate its comfort and privacy! There is a Foot Flush toilet, shower, and sink vanity. 20 lbs. of LP tank capacity ensure that your showers will stay nice and warm throughout the trip! Your used water and waste are discreetly stored in the 30 gallon gray water tank and 30 gallon black water tank, so you don't have to deal with it while you're having camping fun! Children and guests will be able to sleep cozy and secure, thanks to the Bunkbeds in the bunkhouse!